Workplace cruelty is a central issue of our time. But it’s not for “the company” to fix, it’s for you and me to fix. We get outraged by factory production of puppies, as we should. Puppies are fellow creatures; they do not deserve the fear and pain of being mass-produced. Why, then, do we put up with workplaces that are people mills? Human slavery has also gotten a lot of press and attention lately. We call it “human trafficking” for some reason — but it’s slavery. A friend posted on Facebook about hundreds of child slaves being rescued in India. “Eleven children are reported missing in India every hour … many are trapped by gangs and forced into prostitution, child labour and slavery, according to police.” Awful. Companies like FoxConn (makers of your favorite iDevice) get a lot of bad press, too, to the point where Apple, to their credit, has put pressure on their suppliers to address underage labor, forced labor, and a high suicide rate. What can we do about these horrible practices in other countries? Figure out what products are being produced and avoid the products where the manufacturer is not vigorously preventing human abuse. But when it comes to workplace “people mills” in this country, I fear that there’s much more complacency. Sure, the issues are less horrible, but they still have significant impact on an individual’s quality of life and health. Even in the US, most of us have actually worked in one of those places, or know of someone who is currently working in one of those places. The root cause: “companies” treat workers like cogs in a factory, not humans. “Companies” create people mills. I use quotes on the word “companies,” because companies can’t make decisions. Only other people can do that. 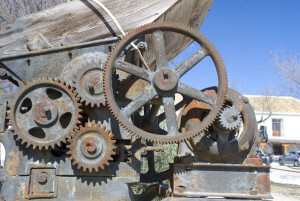 There are people at these organizations who are making decisions to treat people like cogs. “Those people” are you and me, friends. Not all workplaces are as bad as others. But most workplaces that I encountered as a consultant exhibited at least some symptoms of treating folks like machinery in a factory. This is an appeal to those of you who think that you should be operating a people mill instead of a human business: QUIT IT. There are a million ways to hold folks accountable while still recognizing their essential humanity. There are a million ways to make money and also treat people well. Human business doesn’t (ever) beat factory business in the short term, but it always wins in the long term: Factory business scales well, in a linear fashion. But to create competitive advantage, the “hockey stick” curve, you need to follow more human practices. These are well documented and backed by academic research, like the findings in Jim Collins’ book “Good to Great“. If you do indeed want to treat others the way that you want to be treated, try these specific ways YOU can reduce cog-thinking, which in turn will reduce People Millification. Sometimes we see successful companies that have turned into people mills. This generally happens when the founders or investors bring in “real business people” to start to run things. That company then continues to succeed due to its momentum, but I have personally seen organizations fail in the long run because their best and brightest flee what has become a people mill. This phenomenon has only increased as social media pervades our world. Here’s the definition of Institutional Insanity: believing that others will tolerate what we ourselves would not tolerate.